Two DCI corps members were recently awarded $1,000 scholarships from the international nonprofit organization, Dutch in DCI. 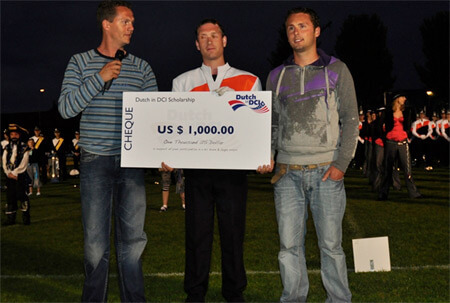 Established by former drum corps members in 2006, Dutch in DCI seeks to provide opportunities for Dutch students to participate with Drum Corps International groups. With financial assistance, the organization helps to offset costs for the overseas performers who often fly back and forth to attend monthly rehearsal camps during the non-touring season. Rene van Doorn (center) on behalf of his brother Erik.